Another three points for Villa on the road, but was the 2-3 win over Southampton a perfect away performance or pot luck combined with a couple of moments of quality? Here’s the Good, the Bad and the Ugly of a dramatic night at St. Mary’s. The result, the goals and the away form. Southampton were unbeaten at home before Wednesday night, and had only conceded two goals in six Premier League home games prior to Villa showing up, something which makes what unfolded even more incredible. Lambert’s formation and tactics for the game, as always, caused a great deal of heated debate amongst Villa fans on Twitter, but he set up the side to win the game without the ball and that’s precisely what happened as Villa continued what is a quite remarkable away record for the club under Lambert in 2013-14. Villa have the third best away record in the league, with the only loss from seven games coming on that night at Stamford Bridge in the opening week, the memory of which is still primarily one of injustice. The first goal on Wednesday night was, in my opinion, the most beautiful thing in football, a Gabby Agbonlahor goal on the break, and the way in which he took it shows that even when he’s not in a rich vein of form he can show composure and killer instinct in front of goal. That goal was Gabby at his best, and showed his form of the latter end of last season – crucial for Villa, particularly away from home. Lambert’s dropping of Benteke was the right decision. Kozák is not universally loved but he puts in more effort by the minute than Benteke has been doing in 90 recently, and three goals from six starts and four substitute appearances is not a bad return at all. Not electrifying, but certainly something to feel encouraged about. The fact that other members of the team have begun to find the net in Benteke’s absence (both his physical absence yesterday and his virtual one for many of the last half-dozen games or so) is particularly pleasing. In the club’s first four league games of the season, Benteke netted four of the five goals scored; in the last four games, the club’s seven goals have been scored by six different players – Kozák twice, Agbonlahor, Delph, KEA, Westwood and Bacuna – and it is these goals from midfield which need to continue throughout the season. As for the third goal, I’ve run out of things to say. Fabian Delph, what a man. We just need Sylla to smack one in now. Villa are unbeaten in five now, and though Fulham away is much tougher now than it would have been two weeks ago, we must be going there believing that we can win the game. Home form remains a key issue. In comparison to the away form, Villa have the fourth-worst home record in the league, with just two wins and six goals from seven games. Manchester United are next up at home, before Crystal Palace on Boxing Day and Swansea two days later. Dare I suggest it, but all three of those games are distinctly winnable. Our home record against United is dreadful, but compared to previous seasons so are they, so let’s wait and see what happens. Palace is three points or embarrassment, and Swansea are struggling this season. Maybe United is slightly optimistic, but the Christmas home fixtures are the golden chance to build upon a win and an admittedly disappointing draw in the last two matches at Villa Park. The away form’s good enough; the home form desperately needs to be too. 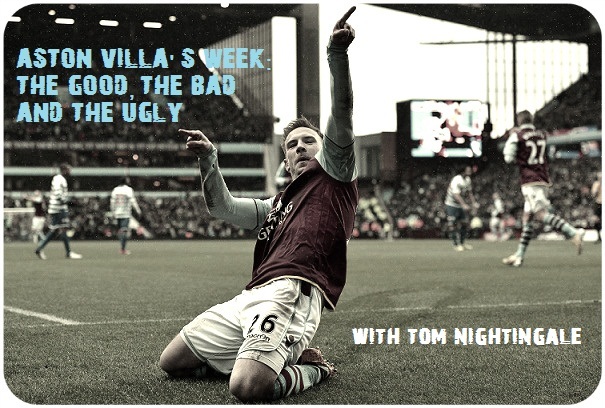 The style of Villa’s win on Wednesday night is still causing rifts amongst Villa fans on social networking sites. 23% possession is poor even when considering that our team was obviously set up to sit behind the ball until a possibility of a counter-attack revealed itself. Villa had three shots on target all game (so at least there’s finally something to be said for our chance conversion rate) to Southampton’s nine, and a total of a mere six shots in comparison to the home side’s 21. According to WhoScored, ex-Villan Steven Davis completed more passes for Southampton than the entire Villa side did (statistics vary depending on where they are taken from, but Villa’s pass count for the 2-3 win seems to sit somewhere around the 100 mark, which is horrendous). Part of it can be put down to tactics, but it was undoubtedly a mixture of industrious performances and good fortune which saw Villa secure a fantastic win. General performance level has been poor since the stirring fightback against West Brom, and needs to improve in the coming weeks to keep the form up.